The Food Forever Cook Book Group is Up and Running! Our first meeting as a group was April 15. There are now 15 of us, elders and students, and our main goal is to produce a cook book filled with recipes and stories from Galiano. With Kenna Fair facilitating, we set up a plan to have the book ready for printing by our deadline – September 2009. Because the cook book will be based on the seasons, we decided to organize ourselves into four research groups of Spring, Summer, Winter and Fall so we can focus on gathering seasonal materials such as photos, art work, recipes and of course, the stories. The stories will come from interviews with the elders of Galiano. 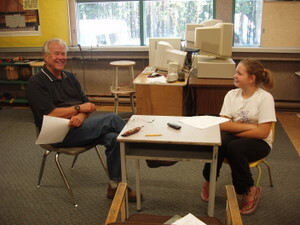 The students create and conduct the interviews and are partners with an elder, while another adult observes and facilitates during the interview. We’ve already done four interviews, and have more scheduled for the next few weeks. There’s no time to waste with our September deadline coming up fast! I really enjoyed my role as observer for Tayler’s interview with her grandmother, Lennis. I heard stories about what it is like to grow up with 11 brothers and sisters, and to be completely self-sufficient for all food – all without any electricity! I also learned about a delicious recipe for a seed bread that Tayler, a skilled baker in her own right, often bakes with Lennis.